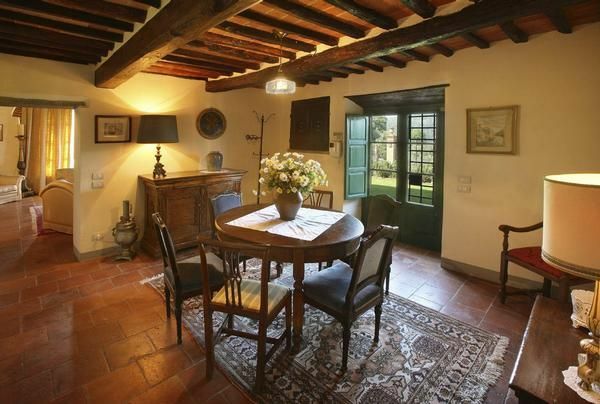 Villa Roncovisi is a typical historical Tuscan villa with exclusive swimming pool. This independent villa, built in the second half of the 18th century, is the centre of a property of over 18 acres of woods and olive groves. It is on the last western slopes of Mount Albano, approximately 250mt. above sea level. Originally it was composed of two farm houses which have been joined together (maintaining however a certain independence if required). The owners have carried out an accurate and rigorous renovation using only materials recovered from the surrounding area and period while ensuring a structure which respects the norms of bio-architecture. The living areas have been renovated with a careful eye for details - antique furniture and ornaments, antique doors, prints, paintings and Persian carpets. lounge room with antique fire place, 2 divans and 1 double sofa bed, card table with 4 chairs. TV room with divanbed for 2, armchair etc. Blue bedroom: double bedroom with king-size bed, wardrobe, 1 chests of drawers, ensuite with Jacuzzi shower; balcony reached by a spiral staircase with single bed. Triple bedroom with 3 single beds, wardrobe and chest of drawers. Bedroom with single bed, built-in wardrobe and chest of drawers. Bathroom with Jacuzzi bath and shower, shared by the bedroom with 3 single beds and the small room. Above the large dining room and reached by a staircase of 9 stairs, a bedroom with 2 single beds (bed-heads in 18th wrhought iron), Piemonte wardrobe (C 19th), C 19th Tuscan bedside table, English desk (C 19th) and C 18th Tuscan chest-of-drawers. A quiet bedroom with pleasant views. The external walls are covered with typical local stone as are almost all the surrounding houses, conserving the original aspect of the building as when it was constructed more than 200 years ago. On the property there is another villa belonging to the owners Villa dell' Angelo with its own garden and swimming pool 100mt. away from the main villa. The villa looks out over typical Tuscan countryside - hills and olive groves, woods of chestnut and oak trees - all immersed in an oasis of silence. The few cars which pass belong to the people living in the area and there is also another road with no outlet. The pool, 6x12mt. and depth of 1.35mt., is exclusive to the guests of Villa Roncovisi. It is situated on a natural terrace a few metres below the villa level and has a wide view of the valley below. It is an overflow pool and is equipped with hydromassage, swimjets system for water treadmill and changing room with shower and WC. The night lighting of the pool and its surrounds is particularly suggestive. The cleaning system of the pool insures utmost hygene and eliminates any possible inconvenience caused by the chloride. The swimming pool has an automatic system for maintaining the values of the PH and of the chlorine in the right range. The water is slightly saline and contains the same percentage of salt as the human eye. The pool is open from mid April to mid October (under normal climatic conditions). There is a sunbathing area with umbrellas, chairs, tables and divans. Further down to the right of the pool there is a relax area with a gazebo and chairs. There is also a small children's corner. Under the pool deck there is a changeing room, a shower and a bathroom. - Climatisation / Ventilators: according to consumption (Mandatory). - Intermediate cleaning: per object and day included in price . - Electricity: per object and day according to consumption (Mandatory). - Cot for adults: per object and day available and included in price (Mandatory). - Final cleaning: per object and week Costs amounting to 300 EUR (Mandatory). Cot (per property and day, included in price 0 EUR). Cot for adults (per property and day, included in price 0 EUR).